On January 22, 2016, the Primates of Local Orthodox Churches met at the Patriarchate of Constantinople’s Orthodox center in Chambesy. Addressing the Synaxis, His Holiness Patriarch Kirill of Moscow and All Russia noted that each meeting of the Primates of Orthodox Churches is an event of special importance. ‘It is an opportunity for us to exchange opinions, to discuss problems of concern for us and to make agreed decisions on matters of pan-Orthodox significance. But above all, it is an opportunity to feel again our unity, especially when we together partake of one Cup in the awareness that we all are one Body in Christ (Rom. 12:5)’, His Holiness said. He also expressed gratitude to His Holiness Patriarch Bartholomew of Constantinople who initiated and organized the meeting. In his address, Patriarch Kirill spoke on various aspects of the preparation of the Pan-Orthodox Council. ‘Gathering together, we are clearly aware that our Church is One and Catholic, that our priority concern is to preserve and consolidate her unity, which is the basis of our entire ministry, including our joint efforts for strengthening the conciliar principle in the Church. The Holy and Great Council is called to become a visible, clear and convincing testimony to the unity of the Orthodox Church. And we all realize that the Council can become such only if it reflects the true unanimity of the Local Orthodox Churches. It is for the sake of this unanimity that we all are to work hard together in the pre-council period’, His Holiness stressed. Speaking about problems impeding the full-fledged unanimity among the Local Orthodox Churches, Patriarch Kirill expressed regret over the breach in communion between the Patriarchate of Antioch and Jerusalem. To restore it, His Holiness believes, is an urgent task in our days when the whole world is following with anxiety the developments in the Middle East since, indeed, ‘it is from religious communities in this region that people expect an example of solidarity and readiness to overcome differences’. 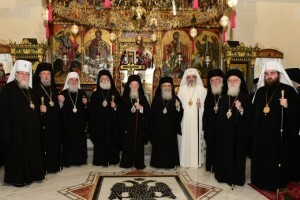 The Primate of the Russian Church expressed deep concern for the actions of some hierarchs of the Patriarchate of Constantinople, who, on their visits to Ukraine, expressed their support for the schismatics allegedly on behalf of His Holiness Patriarch of Constantinople, thus sowing temptation among the Ukrainian faithful and clergy. It is impossible to imagine, he continued, that in Switzerland or in Greece or in any other country in Europe representatives of a different confession could come to an Orthodox church and ‘make the decision’ that they will use this church from now on. ‘But in Ukraine it is a reality. The canonical Church’s communities driven away from their churches have won all their legal cases, but schismatics and their semi-gangster armed units ignore court rulings’. Patriarch Kirill cited as a glaring example of nationalists’ hatred towards the faithful of the canonical Church in Ukraine the situation in the Ptichya village near Rovno, stressing that the proponents of the schism ‘are sowing evil by consciously creating an inter-confessional conflict and splitting the Ukrainian society’. ‘Quite recently, one of their supporters said in public that if His Beatitude Onufry, Metropolitan of Kiev and All Ukraine, still belonged to the canonical Church, it was only because no suitable tool of torture, such as an electric or soldering iron, was found. It is terrible to imagine what would have happened if these bandits had been granted canonical legalization and had joined us!’ His Holiness stated. Patriarch Kirill thanked sister Local Churches, especially those of Alexandria, Antioch, Jerusalem, Serbia, Bulgaria and Poland, for their prayer and support for the Ukrainian Orthodox Church. ‘His Holiness Irenaeus, Patriarch of Serbia, was quite right when he wrote to me about Ukrainian schismatics: these people belong to Orthodoxy only by name and ‘their disdain for Christian moral norms and willingness to hate and spill blood is a living testimony to this’. The only path for these people to come back to the Church lies through repentance. We are asked why we do not want to unite with them and are called to begin dialogue almost on an equality with them, but what harmony is there between Christ and Belial? ‘The Orthodox people of Ukraine continue to support the canonical Church. Now the schismatics are frantically fabricating public opinion polls to prove their popularity in the country. However, many Ukrainian archpastors say that the number of people in churches of the canonical Church has grown. The recent procession with the cross held by our faithful in Kiev on the St. Vladimir Day brought together tens of thousands of people, whereas the similar event conducted by schismatics ended in a shameful fiasco. Few churches, which they have managed to grab from Orthodox communities, have become deserted while real Orthodox communities have not disintegrated but continue to worship in the most unfavourable conditions. I trust in the future of the Ukrainian Orthodox Church; her faithful are united in their condemnation of the schism and violence, and this evil only strengthens them in their feat of love and faith’. His Holiness continued by noting that the process of preparations for the Pan-Orthodox Council has noticeably intensified of late. 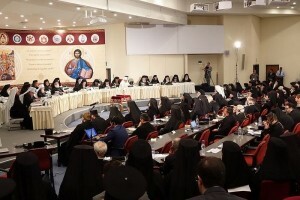 He dwelt on the reasons for the failure to implement a number of instructions given by the previous meeting of the Primates to the Special Inter-Orthodox Commission and the 5th Pan-Orthodox Pre-Council Conference. He pointed in particular to the importance of taking into account the positions of all the Orthodox Churches which carry out their mission in various situations. In this connection, he mentioned still unconsidered proposals made concerning the Pan-Orthodox Council agenda items in the last two years by a number of Local Churches including the Churches of Antioch, Russia, Georgia, Serbia and Bulgaria. Patriarch Kirill also spoke of the need to review the draft document on Calendar, noting that the topic of ‘a more accurate determination of the date of Pascha’ is not at all relevant for the Orthodox Church and can only sow discord among many believers’. No less concern, His Holiness said, is caused by the draft document on Impediments to Marriage, which only contains a bare list of canonical impediments and fails to reflect the Church’s position on the institution of family in the modern world. As one of the very important areas of work Patriarch Kirill singled out the topic of Autocephaly and the Manner of Granting it, proposing that the Council approve the fundamental agreement already reached by the Inter-Orthodox Preparatory Commission that the establishment of new autocephalous Churches should be a pan-Orthodox action requiring consensus of all the Local Orthodox Churches in each particular case. His Holiness also stressed the need for a preliminary examination of the Council’s draft document on the Orthodox Diaspora. Among the points of detailed consideration in Patriarch Kirill’s address was the issue of the venue of the Council, which had already been raised in the address of His Holiness Patriarch Irenaeus of Serbia. ‘As we can see, many problems are to be solved together in order to make possible the convocation of a Holy and Great Council of the Orthodox Church. 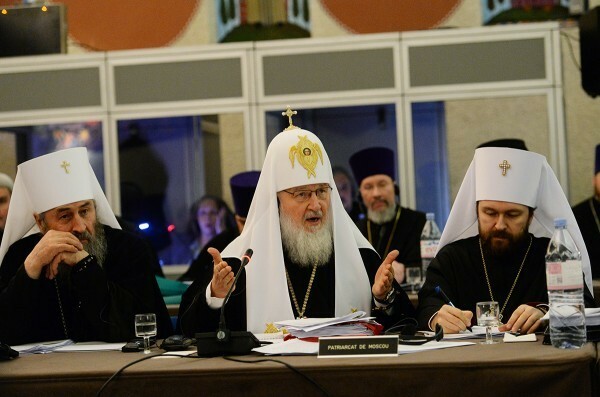 I am sure that the real reason for which many documents are still lacking agreement does not lie at all in the existence of opposite opinions of Churches but in the ineffective methodology of preparing the Council’, Patriarch Kirill stressed. In this connection, he shared the experience of the work of the Inter-Council Present of the Russian Orthodox Church in the form of open discussions enabling any church member concerned to express his or her position. 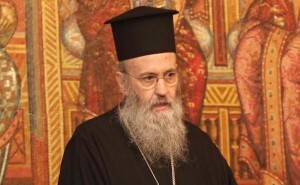 ‘I believe, it is in this way, openly, the preparation of the Council should proceed if we really care for its success’, the Primate of the Orthodox Church said, stressing the importance of having the Council’s draft documents published and overcoming a lack of reliable information that provokes suspicion among many believers. ‘It is my conviction that the long ripened publication of the Council’s draft documents and an opportunity for discussion on them will not at all prevent the holding of the Council but will show us and the whole world the truly conciliar nature of our Church, thus helping consolidate the pan-Orthodox unity’, His Holiness said calling the gathering to pray together to the Lord for His help in the joint efforts for the benefit of the Church and in overcoming all the difficulties standing in the way towards her Great and Holy Council.